Mali Wu and Francesco Manacorda will serve as co-curators of the 11th Taipei Biennial in 2018, Taipei Fine Arts Museum (TFAM) has announced. 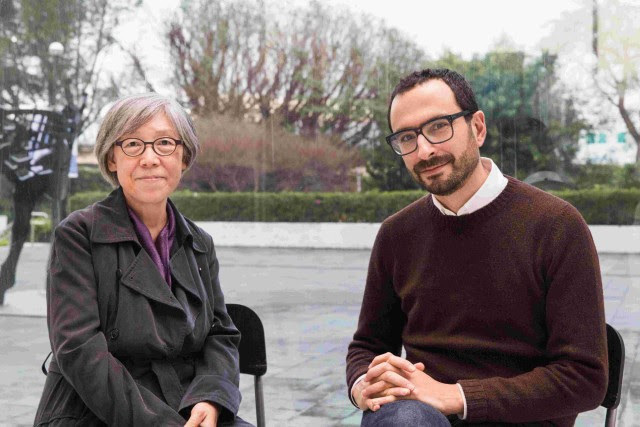 For many years Mali Wu has practiced participatory and community-based art, while Francesco Manacorda has developed a track record curating co-creative and process-based art projects. The Biennial will focus on the interconnectivity of ecosystemic structures formed between humans and nature, and aims to serve as a platform of social experimentation to generate new interdisciplinary possibilities for long-lasting, community-driven, bottom-up synergies. The Taipei Biennial will take place from November 17, 2018 to March 10, 2019. Held by TFAM every two years since 1996, the Taipei Biennial opens a new chapter in 2018. After three successive Biennials pursuing a single-curator strategy, TFAM is reinstituting a two-curator structure, in pursuit of a new model of collaboration between a Taiwan-based curator and a guest curator. Examining trends in biennials throughout Taipei, Asia and the world, TFAM joined with the Taipei Biennial Committee to determine the exhibition’s theme: “life-support, living, survival system.” As a curatorial strategy, TFAM chose a “1+1” team model, aiming to initiate collaborative creativity across different disciplines to transform the art museum into a matchmaking platform, a knowledge framework, and a base of creative production. With the consensus of the committee, Ms. Mali Wu, Taiwanese artist curator and lecturer at Graduate Institute of Interdisciplinary Art at National Kaohsiung Normal University, was first nominated by the museum to respond to the curatorial issue. Mr. Francesco Manacorda, the current Artistic Director of V-A-C Foundation, was further invited with the recommendation by Wu to work together on the curatorial theme of living and survival. With mutual curatorial and academic interests, the two curators jointly proposed the concept of “eco-systemic interdependency” for the 2018 Biennial. While humans are inseparable from their environment, the gradually deteriorating natural ecosystem has become a source of pressure forcing every living being to face the fragility of nature and the consequences of human activity. With the accelerating development of human civilization, frequent, intense interactions between people and nature are increasingly blurring the once clear boundaries between the two. As these cognitive boundaries shift, “nature” acutely needs redefinition, and other concepts related to nature are also being re-examined and reinterpreted. The Taipei Biennial 2018 explores the concept of “ecosystem” in a broader context than merely nature or the biological environment, encompassing cultural, economic and sociological factors as well. “The long-time community engagement efforts Ms. Mali Wu cultivated for years makes this biennial different from others,” says Francesco Manacorda. For past decades, Wu has used art as a medium to build engagement with environmental concerns, producing several representative works with a high level of environmental consciousness rooted in the land of Taiwan. Manacorda’s experience in organizing biennials and conceiving process-based projects will serve as invaluable assets for the Taipei Biennial 2018. The large-scale exhibition he curated in 2009 addressing the interrelationship between humans and nature, Radical Nature –Art and Architecture for a Changing Planet 1969-2009, will serve as a uniquely vital foundation for the upcoming Taipei Biennial. A profound conversation between art and nature will place the subject of “eco-systemic interdependency” in a broader, deeper context. “We should focus on life itself and respond collectively to living,” says Wu. “I hope this exhibition can be an experimental laboratory that incubates collaborations among talents from different fields.” As a bottom-up knowledge platform, the Taipei Biennial 2018 will employ cross-disciplinary creations and a forward-leaning vision to initiate a new conversation in local socio-cultural context. A graduate of Kunstakademie Düsseldorf (the Arts Academy of the City of Düsseldorf) in Germany, Mali Wu currently teaches in the Graduate Institute of Interdisciplinary Art at National Kaohsiung Normal University. Following the avant-garde tradition, Wu’s artistic practice and research focus on what art can do in the public sphere. In the 1990s, she started to criticize the state of social and political affairs from a feminist perspective in her works. She has launched a series of community-based projects of new public art, including the participatory art workshop “Playing with Clothes” organized by Awakening Foundation as part of Awake in Your Skin(2000-2004), which reversed the tradition of women’s needlework and discussed women’s lives through clothes and weaving; Art as Environment: A Cultural Action on the Tropic of Cancer (2005-2007) in Jiayi County which promoted equality of cultural participation rights in rural areas; By the River, on the River, of the River – A Community Based Eco-Art Project (2006); Restore Our Rivers and Mountains – Along the Keelung River,a collaboration with a community college attempting to stimulate discussion about rivers and current environmental issues; and Art as Environment: A Cultural Action at the Plum Tree Creek, a collaborative project with Bamboo Curtain Studio which re-examined urban ecology and development through an ignored creek. She won the 11th Taishin Visual Art Award in 2013 with Art as Environment: A Cultural Action at the Plum Tree Creek and the 19th National Award of Art, Taiwan in 2016. Wu has consistently dealt with ecological issues by adopting art as an approach to bridge culture and nature, demonstrating the potential for contemporary art and the vital personal energy of an artist. Born in 1974 in Turin, Italy, Francesco Manacorda earned a degree in education from the University of Turin (2000) and an MA in Curating Contemporary Art from the Royal College of Art, London (2001-2003). An experienced art writer, he has published articles and reviews in such publications as Artforum, Domus, Flash Art, Frieze, Metropolis M, Mousse, Piktogram, Kaleidoscope and ArtReview. He has edited numerous publications and written critical monographs on several artists’ works. Between 2007 and 2009 he served as curator at the Barbican Art Gallery, where he realized the large-scale exhibitions Martian Museum of Terrestrial Art and Radical Nature – Art and Architecture for a Changing Planet 1969-2009 (2009). In 2007 he curated the Slovenian Pavilion at the 52nd Venice Biennale and in 2009 the New Zealand Pavilion at the 53rd Venice Biennale, while in 2013 he was a member of the International Jury for the 55th Venice Biennale. His curatorial practice has also included freelance projects such as Subcontinent – The Indian Subcontinent in Contemporary Art, Fondazione Sandretto Re Rebaudengo, Torino, Italy (2006). From February 2010 to March 2012, he was director of Artissima, the international fair of contemporary art in Turin, and from 2012 to 2017 he was artistic director of Tate Liverpool where he curated exhibitions such as Mondrian and His Studios; Glenn Ligon: Encounter and Collisions; An Imagined Museum; Leonora Carrington: Transgressing Discipline; and Cathy Wilkes. In 2016 he co-curated the Liverpool Biennial. He was visiting lecturer in exhibition history and critical theory at the curating contemporary art department of the Royal College of Art, London from 2006 to 2011. He is currently artistic director of the V-A-C Foundation and visiting professor at LJMU School of Art and Design in Liverpool.